Omron Automatic Blood Pressure Monitor with Easy Wrap Cuff, HEM-773AC5 Year Warranty!Easy Wrap Cuff will now fit standard adult and large adult arms! Eliminating the need for 2 different cuffs. This machine does NOT come with a small or large cuff. If you need a infant or child cuff, you must buy Model HEM-705CP or HEM-711AC with the accessory part # H-003DS (small cuff 7-9"). If larger arms and cuff you need part # H-003D (large cuff 13-17").AC Adapter Included: Minimizes battery usage and allows for an optional method of operation. Also includes 4 "AA" batteries for portable usage.Perfect for People who:Have difficulty wrapping and applying an arm cuff on their ownRequire an Extra Large CuffPrefer the traditional arm BP monitor over wrist monitorOwn an arm BP monitor, and are in the market to upgradeWant to share and track monitor readings with someone else in their family or householdPrefer latest technology and featuresWant the convenience and option of the AC AdapterThis versatile machine is perfect for consumers who wish to upgrade to a unit with the latest technology, Clinics and Assisted Living Facilities who want the convenience of using only one cuff, or Long Term Health Care Providers for ease and convenience of travel. Not only does the HEM-773AC Automatic Blood Pressure Monitor utilize Omron's patented IntelliSense technology, but it also features the innovative Easy-Wrap Cuff. No more messing with arm cuffs that are difficult to use. The Easy-Wrap cuff is designed for a quick and proper fit for any arm size between nine and 17 inches in circumference.. Taking your blood pressure just got a little bit easier -- simply wrap cuff around your arm and press start. In seconds your blood pressure and pulse are displayed on the large digital panel. Proven time and time again, Omron's IntelliSense technology ensures accurate, clinically-proven, and comfortable readings. And with the two-person, 21 memory recall, you can track your blood pressure and pulse progress as you work towards a healthier lifestyle. The Omron HEM-773AC delivers accurate, clinically-proven blood pressure readings in the comfort of your own home. View larger. To take an accurate reading, first position the green marker directly over the artery on the inside of your arm. 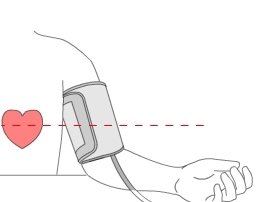 Next, place your arm on a table so the cuff is positioned at the same level as your heart. There are several easy steps to taking your blood pressure with this monitor. First of all, avoid eating, smoking, and exercising for at least 30 minutes before taking a measurement. Remove tight-fitting clothing from your upper arm, and sit in a chair with your feet flat on the floor. Slide your left arm through the cuff and position the cuff approximately 0.5-inches above the elbow. On the cuff you'll notice a green marker; position this marker directly over the artery on the inside of your arm. Next, secure the cuff with the Velcro material. The cuff should make direct contact with your skin, but you should be able to easily fit your index finger between the cuff and your arm. Place your arm on a table so that the cuff is positioned at the same level as your heart. Rest comfortably in a relaxed environment for at least 15 minutes prior to taking your blood pressure measurement. Once you feel relaxed, simply press the start button and remain still. The cuff will begin to inflate and numbers will appear on the display as the heart symbol flashes. When the measurement is complete, the cuff will deflate, and your blood pressure and pulse rate will display on the screen. If you need to stop the measurement at any time, simply press the on/off button and the monitor will immediately deflate. And remember, always consult your physician for specific information about your blood pressure. The IntelliSense monitor inflates the cuff to the ideal level with each use -- you never have to make any adjustments to select an inflation level. This is especially convenient for hypertensive users and for people with certain arrhythmia or heart disorders because their blood pressure is so likely to fluctuate. The biggest advantage of using the IntelliSense technology is a personalized inflation, every time, for maximum comfort. Additionally, many factors can affect your blood pressure, including physical exertion, emotional fluctuations, medications, and stress. So having your blood pressure monitored at a pharmacy with an in-store device after you've been shopping or walking around might not provide you with the most accurate measurement. Monitoring your blood pressure at home allows you achieve a relaxed state more easily, and it gives you the flexibility to take your measurements at various times during the day. By keeping track of your home blood pressure readings, you can provide your healthcare professional with a log of your measurements over time. This can help them evaluate the effectiveness or need for medication. Omron HEM-773AC blood pressure monitor, AC adapter, arm cuff, four AA batteries, and instructions manual. The Omron HEM-773 was recommended to me by a co-worker who was very pleased with the instrument. Since we both work in a hospital and have a good working knowledge in the area, I thought that this would be a slam dunk purchase. The reading varies from 10 to 15 units off from manual readings from 3 different well trained nurses. The unit is very easy to use and good features for the money but if I don't have confidence in the reading, what good is it. I rarely get it out and when I do, it just makes my literal "blood pressure" go up by it's misreading. I would think that a instrument such as this would have a calibratiion mechanism. 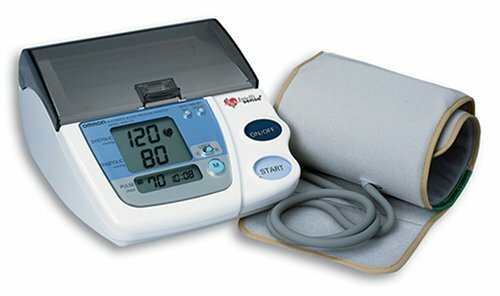 The Omron HEM-773AC Blood Pressure Monitor is one we have owned for well over a year and have been satisfied with. In that time the readings for both my husband and myself have been most consistant. While most home units may not be as accurate as the doctor's, this Omron comes as close as any. This monitor will give you a basic normal reading to use as the standard for your blood pressure readings at home. You should take your unit to your physician's office to be calibrated for accuracy. You will have then have a good base level from which to determine what, if any, adjusment needs to be made to the reading of your particular monitor. There have been times when I've had to have my blood pressure checked and rechecked within minutes at doctor's offices. In doing so, they found a significant difference in their readings. The reason: Unknown. I don't know why. They don't know why. I do know having a headache will affect my BP but such was not the case in these readings. So I'm not frustrated if my unit does the same every once in a blue moon. Very easy cuff to use, both for myself and the bride. The A/B switch offers us both our individual history of last 20 readings. Deleting history in total is allowed although I would have liked to be able to delete the last one taken. The fact that it uses both battery and house-supplied power is a big plus. I have been using the HEM-773AC for several weeks. To test the accuracy of the device I took it with me when I had a checkup at the hospital. The reading was within 2 for both Dia and Sys, therfore I am quite pleased with the instrument. Another excellent point is the long guarantee period of the instrument. this particular unit gives an error reading about 90% of the time. I probablly will have to go through the effort of reboxing and sending back if they will take it without a lot of grief. My recent purchase of a Blood pressure cuff was handled in an excellent manner. It was delivered at the appropriate time and date. I'll be using you again.